Remember when the remnants of Biollante went to space after Godzilla vs. Biollante? Or when Mothra went out into space in Godzilla vs. Mothra? Well it seemed that cells of Godzilla went with them. Those cells are exposed to radiation from a black hole and become a monster known as SpaceGodzilla. SpaceGodzilla then makes its way to Earth. Meanwhile, the UNGCC is again trying to neutralize Godzilla. This time, their goal is to plant a device on the monster to allow them and the JDSF to control him telepathically. The project, known as Project T, leads them to Birth Island where Godzilla is staying at the time. The UNGCC enlist the aid once again of psychic Miki Saegusa on Project T. While trying to implement this, the Cosmos, the twin priestesses of Mothra warn Miki that SpaceGodzilla is coming. Since Mothra is away (remember she is out trying to stop a meteor from hitting the planet), the Cosmos say that Godzilla is the one to defend the planet. The JDSF send out their response to SpaceGodzilla with M.O.G.E.R.A., a robotic replacement for Mechagodzilla but M.O.G.E.R.A. is no match for SpaceGodzilla and is defeated. SpaceGodzilla is attracted to Birth Island and Godzilla. SpaceGodzilla ends up finding Little Godzilla (Baby Godzilla from Godzilla vs. Mechagodzilla) and attacking it. Godzilla comes to the rescue of Little Godzilla but ends up getting beaten up in the process. SpaceGodzilla kidnaps Little Godzilla and the two head for Japan. Meanwhile, Miki gets kidnapped by the Yakuza. They want to use her and her psychic powers to try to control Godzilla. However, she is rescued before SpaceGodzilla destroys the building she is being held in the city of Fukuoka. SpaceGodzilla sets up base in the city near Fukuoka Tower and builds a fortress out of crystals. This position allows the monster to gain power while draining the Earth of energy. The JDSF once again sends M.O.G.E.R.A. to fight SpaceGodzilla and Godzilla as well joins in on the fight. Once again, both are defeated by SpaceGodzilla. The JDSF then realize SpaceGodzilla’s weakness, cutting it off from it’s energy source. So M.O.G.E.R.A. separates into two parts, a airship and a tank to take care of the crystals. Meanwhile, Godzilla goes after Fukuoka Tower and SpaceGodzilla. Once the crystals and tower and knocked down, Godzilla and M.O.G.E.R.A. fight SpaceGodzilla. M.O.G.E.R.A. is demolished but is able to weaken SpaceGodzilla enough for Godzilla to destroy the monster and frees Little Godzilla. As the film closes, Miki uses her psychic powers to remove the Project T chip and Godzilla and Little Godzilla head back to Birth Island. As we’ve seen in previous films in the Heisei series, there are certain themes and stories that run through and interconnect. 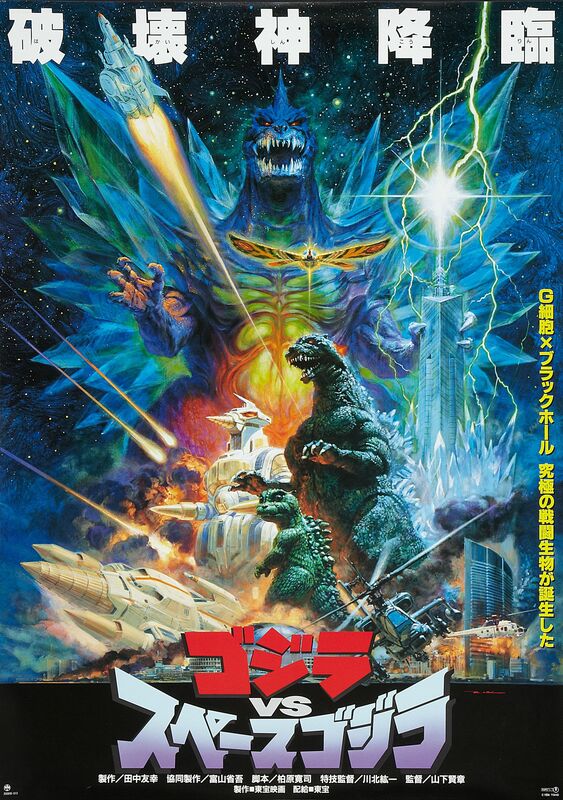 This film has implications that center around the theme of the film (creation of SpaceGodzilla, need for Godzilla to defend the Earth, use of psychic powers). We also continue to see the evolution and growth of the character of Miki Saegusa. She has a prominent role in this film and we see her defend Godzilla in a way that hadn’t really been seen up to that point. 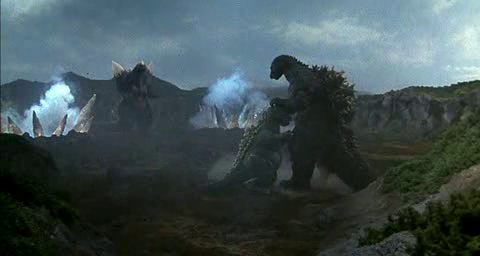 Godzilla is a sympathetic character who in many ways fights only when provoked. Unlike some films, he is not a villain. In many ways, he just wants to be left alone but will defend himself or go on the offensive if necessary. There is only one more film in the Heisei series. Next time will be a wrap up of that film and also the series as a whole. In 1992, the U.N. establishes United Nations Godzilla Countermeasures Center or UNGCC. This task force is to deal with Godzilla whenever he appears. The UNGCC salvage from the ocean the remains of Mecha King Ghidorah (connects back to Godzilla vs. King Ghidorah) and create two weapons to fight Godzilla. 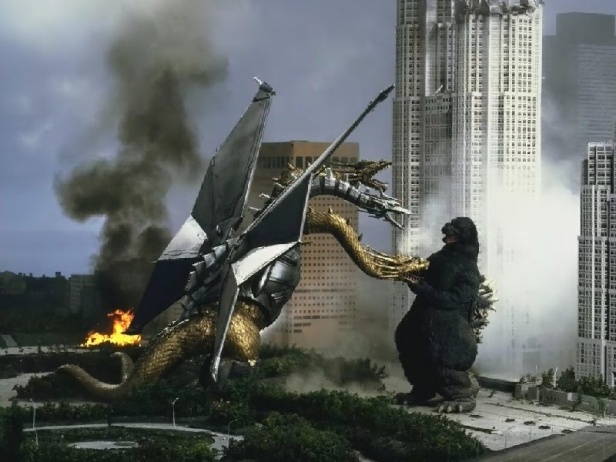 One was a flying gunship named Garuda and the other was a machine modeled after Godzilla called Mechagodzilla. Several years later, during an expedition to a remote island, a strange egg is discovered that attracts not only Godzilla but also another monster in the form of Rodan. The research team was able to rescue the egg while Godzilla and Rodan fought. The egg is taken to Kyoto and later hatches and reveals to be a Baby Godzilla. The Baby Godzilla imprints itself on one of the female scientists. Godzilla is still attracted to finding Baby Godzilla and comes to Kyoto. The Japan Self Defense Force gets the UNGCC to mobilize Mechagodzilla to try and defend the city. Godzilla defeats Mechagodzilla and comes into the city. The UNGCC are able to shield the link between Godzilla and Baby Godzilla. Godzilla ends up leaving Kyoto but not before destroying a good part of the city. After studying Baby Godzilla, they discover there is a weakness that they could exploit in defeating Godzilla (a second brain). So they equip Mechagodzilla to be able to expose and exploit the weakness and send Baby Godzilla (along with the scientist that Baby Godzilla was connected to) out as a decoy. However, Rodan ambushes the transport with Baby Godzilla and the scientist. The UNGCC is forced to send Mechagodzilla and Garuda after Rodan. 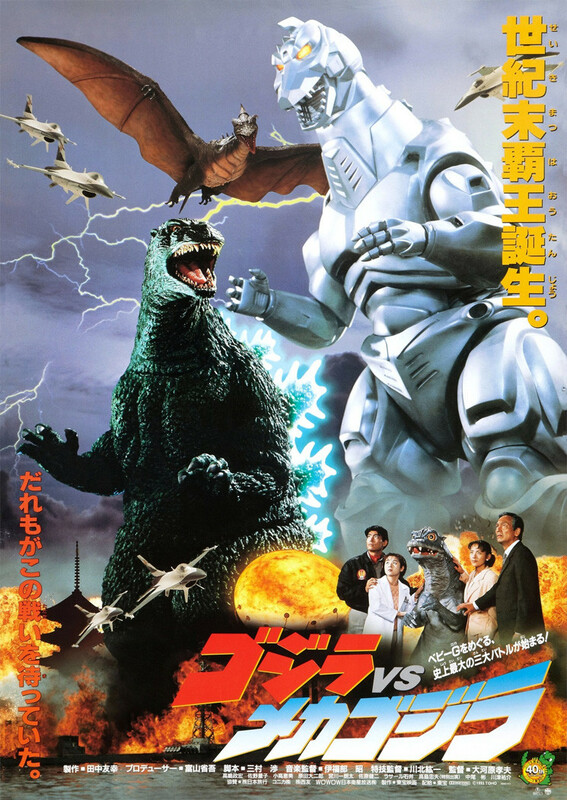 An epic battle happens between Mechagodzilla, Rodan and Godzilla. In the end, Godzilla ends up being the lone victor. Godzilla, with help from psychic Miki Saegusa who is a part of the UNGCC, accepts Baby Godzilla and the two head out to sea. In this film, Godzilla is not really protrayed as a villain. He’s more just going about things and gets attacked because he’s trying to get to Baby Godzilla. If there is a villain it would be Rodan. This film continues the trend of growing sympathy for Godzilla. We see this not only in the returning character of Miki but also several of the scientists and children who interact with Baby Godzilla. This version of a younger Godzilla is different from the Showa era Minilla as a more serious version (or at least will grow into that). Godzilla vs. Mechagodzilla continues the storyline of the Heisei series and tells a good story not only in it’s own right but also within the series as a whole. This passage is one of the more well known verses in the Old Testament. The prophet Jeremiah is writing looking ahead to the future and the future promise of a restored relationship with God and His people. This is ultimately fulfilled in Jesus. The writer of Hebrews will quote this passage in his letter in Hebrews 8:8-12. Because of Jesus, we get to know God the Father personally. We get to have a relationship with Him. We are able to have our sins forgiven when we repent. That is good news worth sharing. Godzilla is awakened after a meteor hits in the ocean nearby him. Meanwhile, the main humans in the film are Takuya Fujita, a thief with a good heart deep down and Masako Tezuka, Takuya’s ex-wife. They also have a daughter, Midori (though she does not know about Takuya and his thieving ways). The stories intersect when Takuya is offered an opportunity at freedom in exchange for helping Masako & the Marutomo company in exploring a certain island. While exploring, they come across a strange egg along with two tiny twins known as Cosmos. The group finds out that Cosmos along with the egg are associated with Mothra. Mothra has always been charged with defending the Earth. However, a long time ago, there was also another defender of Earth named Battra. However, one battle long ago against an ancient civilization that tried to control the Earth’s climate, drove Battra to war with anything and everything, including the Earth. 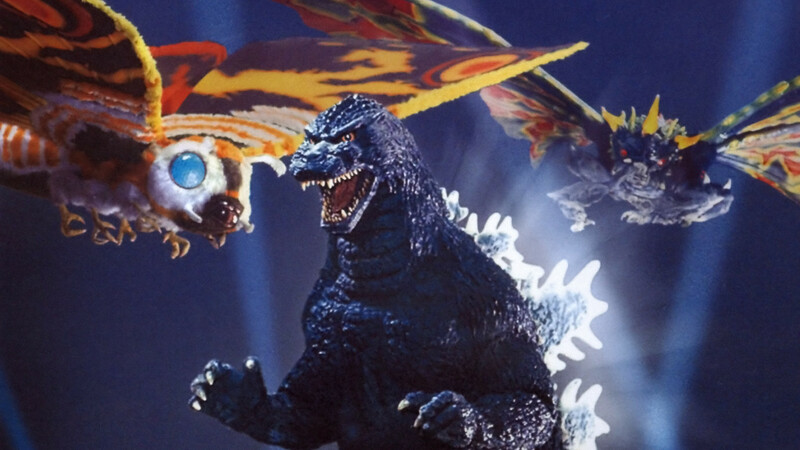 Mothra defeated Battra and the ancient civilization, and the two went into hibernation. However, with the recent disasters that had taken place, Mothra’s egg had been uncovered and the Cosmos were worried that Battra might return. Sure enough, Battra does returns and gets into a fight with Godzilla. Mothra, in it’s larvae state, is caught in the middle of the battle out at sea but is able to escape. In some ways similar to the 1964 film Godzilla vs. Mothra, Takuya tries kidnap the Cosmos and hold them ransom. Mothra in turn, would come to the aid of the Cosmos by coming to Tokyo, willing to destroy the city if it needed. Masako and Midori, with the help of psychic Miki Saegusa, try to convince Takuya to let the Cosmos go for the sake of the city. Takuya does come to his senses and releases them and the Cosmos convince Mothra not to attack the city. Miki senses that Godzilla has surfaced from Mount Fuji and this will set the showdown between Godzilla and Mothra with Battra eventually siding with Mothra. The battle ends with Godzilla defeated and sent back to the ocean. Battra sacrifices its life in the process. At the end of the film, Mothra flies out into space to defend the Earth from a huge meteor that Battra would’ve protected the Earth from if it was still alive. As far as the Heisei series, this one is the least connected to the previous films. Miki Saegusa does make an appearance but it is a brief one. It does set up that she is working with the Japan Self Defense Force and this will play a bigger role later on in the series. It also continues to show the growing concern and care that Miki has for Godzilla. Godzilla vs. Mothra ranks near the bottom if I was listing my favorite films in this series. 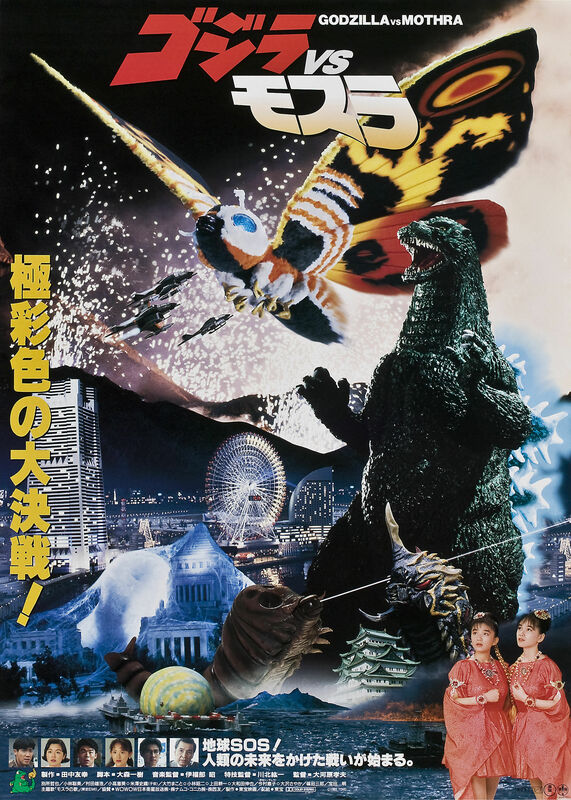 It’s a good film, I just like my Godzilla films where Godzilla is at least an antihero, and that usually isn’t the case when Mothra is around. It is interesting to see the path that Takuya takes throughout the course of the film. He does go from someone who you generally don’t like to being likeable at the end. Set in1992 (a few years after the events in Godzilla vs. Biollante), an author on books on psychic phenomena named Kenichiro Terasawa learns of a group of Japanese solders during World War II that were stranded on Lagos Island in the Pacific that were saved by a mysterious Godzillasaurus in 1944. One of those survivors, Yasuaki Shindo, would later become a wealthy businessman in Tokyo. Ten years later, this Godzillasaurus would be exposed to the hydrogen bomb that destroyed the planet and would become the Godzilla that surfaced in 1984 (in The Return of Godzilla). Meanwhile, a UFO lands on top of Mt. Fuji. In it are three humans from the future: Wilson, Grenchko and Emmy Kano. They are joined by the android M-11. They bring word that they come 2204 in a time when Japan was wiped out due to Godzilla. They offer to go back in time to 1944 to remove the Godzillasaurus from Lagos Island to prevent it from becoming Godzilla. They offer proof of their time travel by showing them a book written by Terasawa that has not been written yet. Terasawa, Professor Mazaki and psychic Miki Saegusa (previously seen in Godzilla vs. Biollante) travel back in time with the Futurians (as they are known) and help to move the Godzillasaurus to the Bering Sea. However, before they leave, the Futurians leave behind 3 artificial creatures known as Dorats. These creatures would fuse together during the hydrogen bomb tests to become King Ghidorah. The truth would later be revealed that the Futurians wanted to hold Japan for hostage as in their future, Japan would be the dominant world power and they wanted to be the ones in control and would use King Ghidorah to help subjugate the Japanese. Emmy would side with the Japanese and along with a reprogrammed M-11 try to help the Japanese against Wilson, Grenchko and King Ghidorah. Hope was thought lost that there would be no Godzilla. However, come to find out that there was a Soviet nuclear sub that sank in the Bering Sea where the Godzillasaurus was transported to which gave off enough radiation to turn him into Godzilla. So in essence, this was still the Godzilla that surfaced in Japan in 1984 and following. 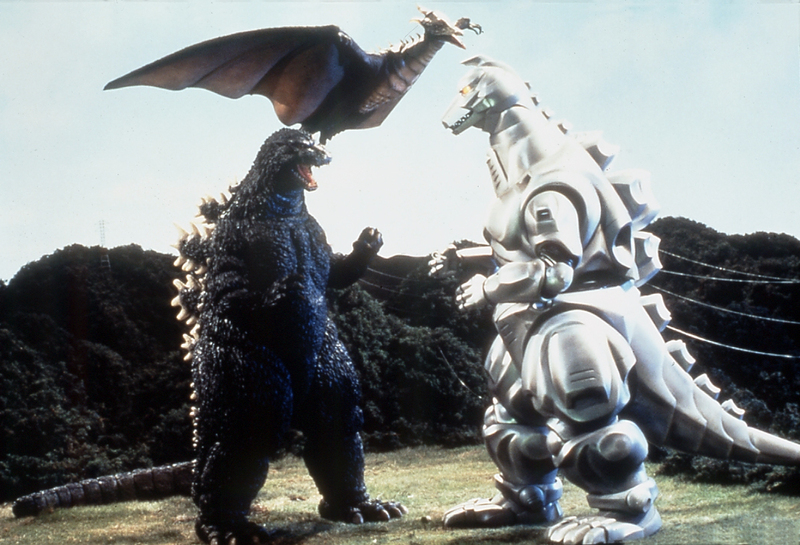 This would set up showdowns first between Godzilla and King Ghidorah and later between Godzilla and a Mecha King Ghidorah (with one of the heads being a robot head). 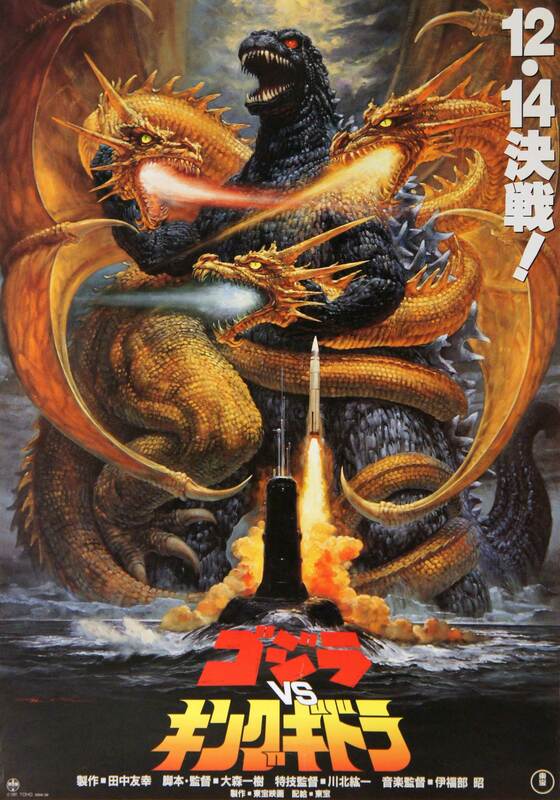 The second battle would end with both Mecha King Ghidorah and Godzilla ending up in the bottom of the ocean. Emmy would return to the future but not before informing Terasawa that she was a descendent of his. This film helped to tell an origin story for Godzilla, or at the very least an origin story for the Heisei Godzilla. Like many of the films in this series, Godzilla is not really an antagonist. Granted he does try to destroy Tokyo, but he also defeats a monster who is controlled by the villains in the film. It is interesting to see how time travel is brought into the picture and how it was thought that events were changed to have no Godzilla, there still ended up being Godzilla. Like I mentioned earlier, Miki Saegusa, appears in this film and helps to establish her role as the go to character for “psychic phenomena”. Godzilla vs. King Ghidorah is in some ways a throwback to the old Godzilla films while setting it into a sense of modern day context (well at least the late 80s/early 90s).